From large storage area and freezer space right up to usable workshop, our garages are fast becoming a great way to maximise usable space in our home. 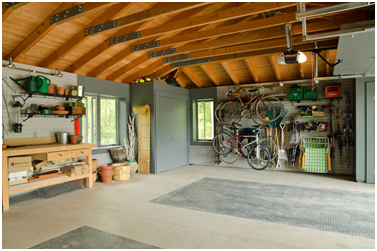 In this article in The Telegraph, property experts say around 90% of UK garages aren’t used to store a car in. Converting yours to some kind of usable space is a great way to boost that value of your property. You may need to make adjustments to create a usable space and consider insulation as well as flooring and wall coverings. 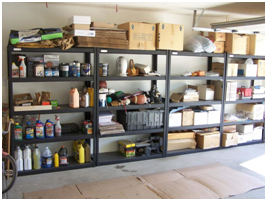 Also consider organisation with storage units and garage shelving like those available at garage shelving solutions. Most garages will have a concrete floor which will likely not be damp proofed. Before adding insulation, you will need to lay a damp proof membrane or alternatively a painted-on damp proofing product, to seal the area before adding your insulation. The insulation is usually in board form and can either be added on top of this to be screed over, a raised wooden floor created with the insulation between the joists or a ‘floating’ floor where the floorboards themselves sit directly onto the insulation boards. There are different types of insulation boards for different levels of insulation and type of installation but manufacturers’ websites offer plenty of information to help you choose the right type for your needs and budget. Unless you have a really old or non-standard construction garage, it is likely to be built from bricks and will already have a damp proof course installed. Therefore, it’s simply insulation that will be required for walls. The simplest way is to install insulated plasterboard to timber batons attached to the walls, but if preferred, a full timber frame could be attached to the walls, insulation boards in-between and plasterboard over the top, ensuring high levels of thermal insulation. Unless you are removing the door and having a new wall and window added this will likely be a big area of heat loss. Obviously, ensure the areas around the frame are covered with insulation like your walls, but it is also worth considering something across the inside of the door. Various thermal products are available including insulation boards, but even a decent layer of bubble wrap taped to the metal frame will make a difference.